For as long as I can remember I have spent Fashion Week stalking the shows for what's new. Whether I'm lucky enough to get invited along or I'm absorbing the photos and videos on Vogue's website between meetings, I'm always looking for those little updates to keep looks fresh. This week is of course New York Fashion Week and I am doing the website stalking rather than the partying. Work is super busy (mostly working on Christmas Windows) so I'm thrilled to have new inspiration on my commute to and from the office. 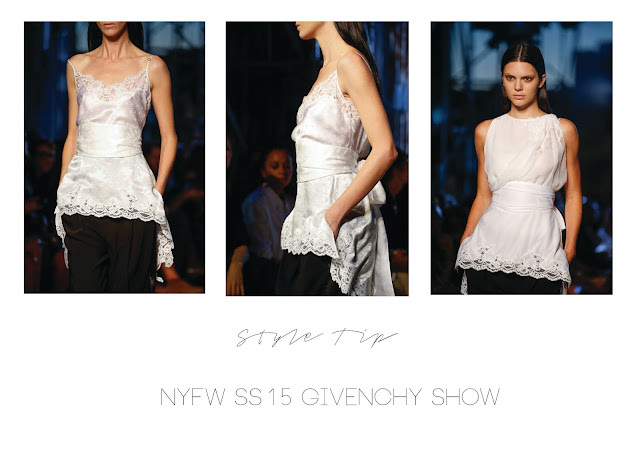 One look that I adored at Givenchy was a simple scarf tied around a camisole like a belt. It feels elegant and modern and looks amazing with a pair of wide-leg suit trousers. If you don't have a suitable top and scarf hidden away already here are a few of favourite my picks.